Check our sales and promotions page for current offers. Carpet makes the room. It is often said that carpet "makes the room". 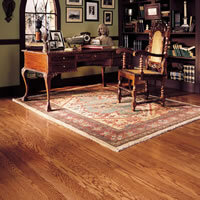 After all, carpet can account for 50% of the visual impact of a room. Carpet can be a neutral backdrop for your furnishings, or it can anchor the room and reinforce your color statement. Either way, you cannot ignore it. Old, shabby carpet will bring the rest of the room down. If you've got to cut the budget, scrimp on the ceiling!